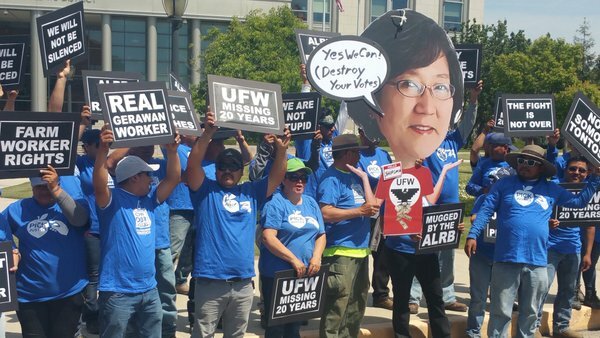 The ALRB has spent $10 million to deprive Gerawan workers of their voting rights on whether or not to decertify a union that claims to represent them. The workers voted in an ALRB-supervised election in 2013, and ALRB has refused to count their ballots. How confident should Senators be when a governor’s appointee to the state Ag Labor Board faced opposition testimony with a line out the hearing room door, “and around the block,” but not one person attended in support? A testy and contentious confirmation hearing before the Senate Rules Committee Monday for Genevieve Shiroma, a 17-year member of the California Agricultural Labor Relations Board, ended after extensive testimony with a proverbial “F-you” to farm workers, when lawmakers voted 3-2 along party lines to confirm Shiroma. Many Gov. Jerry Brown appointees must be confirmed by the state Senate. But they first receive approval from the five-member Senate Rules Committee before receiving an up or down vote by the full Senate. The committee is run by Democrats, and chaired by Senate leader Kevin de Leon, D-Los Angeles. What was supposed to be thorough examination of the Governor’s appointee, was anything but. The hearing opened with de Leon asking Genevieve Shiroma if she had any special family or friends she wanted to introduce, as though this confirmation hearing was a celebrations, and had already been decided. She introduced her posse from the ALRB: ALRB Chairman William Gould, board member Cathryn Rivera-Hernandez, ALRB General Counsel Julia Montgomery. This comes as no surprise since the Agriculture Labor Relations Board members and staff are currently being sued in federal court for violating the civil rights of Gerawan Farming employees in their refusal to count the ballots from a November 2013 union decertification election. The ALRB has acted more as an adjunct to the United Farm Workers labor union than as an impartial adjudicator for farm workers and employers. Genevieve Shiroma, the subject of a legal brief to disqualify her from the ALRB for bias and conflicts of interest, gave rambling, disjointed, and repetitive testimony Monday. 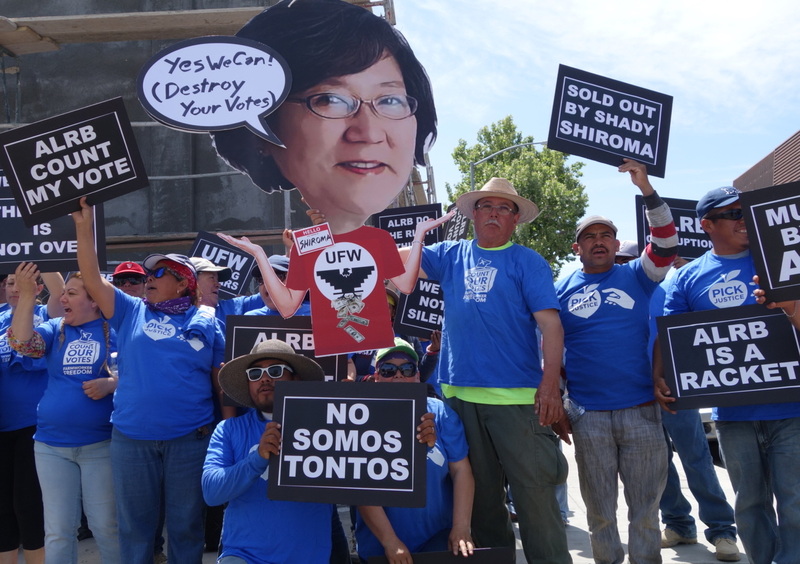 But it is her dubious relationship with notorious UFW lobbyist Richie Ross, with which Shiroma’s career is so inexorably linked, that drew the most questions. But these questions only came from Republican Senators; the Democrats were too busy offering Shiroma hearty congratulations and job tips. 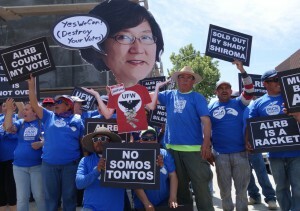 “As the president of my union and the California Labor Federation, I don’t feel you have a bias,” said Sen. Connie Leyva, D-Chino, and former President of the United Food and Commercial Workers (UFCW) Local 1428. “Mr. ‘Gerwin’ [sic] is a billionaire… I wonder if he’s supporting the farmworker overtime bill,” Leyva added. Senate President pro Tem Kevin de Leon asked Shiroma what the ALRB was doing for outreach to non-English speakers, as though this was a new concept. For the record, Gerawan has been family owned and operated since 1938, and is run today by Ray Gerawan and his sons, Mike and Dan, who can often be found working along side the farm workers in the fields. When asked about decisions agains tfarm workers which appear biased, Shiroma repeatedly said she follows the rule of law, as well as National Labor Relations Board precedence. Yet, as Berryhill acknowledged, with Shiroma’s payments and contributions to Ross over the years, she’s being legally challenged over a conflict of interest and her ability to render fair and objective decisions, by Silvia Lopez, a 17-year farm worker at Gerawan Farming in Reedly, CA. Sen. De Leon asked for any Shiroma supporters to testify. When there were none, he called for those opposed her to line up. A line out of the hearing room door formed of mostly Gerawan farm workers, identified by their “PICK JUSTICE” t-shirts, as well as some ag industry lobbyists, farmworker advocate Jesse Rojas, and Anthony Raimondo, the attorney for Silvia Lopez. De Leon would not allow Rojas to translate the farm workers’ statements, ironically after asking Shiroma about the importance of ALRB outreach to non-English speaking farm workers. So each of the workers spoke in Spanish, which de Leon said he’d summarize and translate for committee members at the end. “Muchas Gracias, gracias,” said De Leon. An important legal note: California is the only state in the country that allows a state agency to impose contractual terms upon a single private employer and labor union where there is no contract, and no agreement to permit a third-party arbitrator to set wages, terms, and, and employment conditions between one farmer and its workers. Attorney Raimondo spoke about the blistering Department of Finance audit of the ALRB for sloppy financial practices and the board’s inability to justify its budget, as well as failing to fulfill its primary mission of supervising worker elections on union representation. 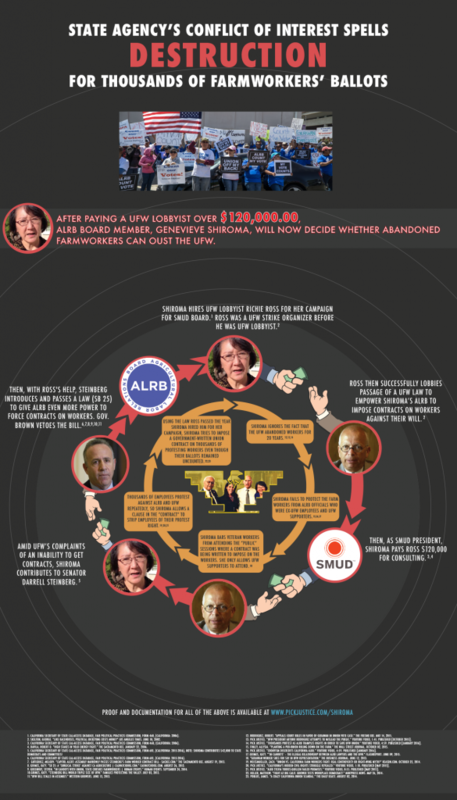 Raimondo said the ALRB spent 34 percent of its increased budget on litigation and other actions against the employers and employees of Gerawan Farming, more than $10 million, to force a UFW contract on Gerawan and its workers — the opposite of what the audit says is ALRB’s primary role. Sen. Kevin de Leon’s summary to the Rules Committee members: “They want their votes counted.” And then he hastily called for a vote for the committee. Democrat Senators Kevin de Leon, Connie Leyva, and Holly Mitchell all voted to confirm Shiroma. Republican Senators Tom Berryhill and Anthony Cannella voted no.